In 1998, Irish PEN set up an award to honour an Irish-born writer who has made an outstanding contribution to Irish Literature.This Award is for a significant body of work, written and produced over a number of years, and is open to novelists, playwrights, poets, scriptwriters etc. Members of Irish PEN, as well as previous winners nominate and vote for the candidate. In keeping with the tradition started at the W.B. Yeats dinner in 1935, the writer is presented with the Award in the company of other writers at our annual dinner. 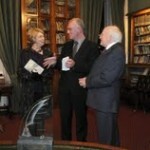 In 1999 the first Irish PEN Award was presented to John B. Keane. Since then Brian Friel, Edna O’Brien, William Trevor, John McGahern, Neil Jordan, Seamus Heaney, Jennifer Johnston, Maeve Binchy, Thomas Kilroy, Roddy Doyle, Colm Tóibín and Joseph O’Connor have been recipients. We request your nominations for next year’s Award, and very much look forward to seeing you at our Award Dinner in February. Postal Address for nominations : c/o Irish PEN Correspondence Secretary, United Arts Club, 3 Upper Fitzwilliam Street, Dublin 2. This entry was posted in Events, Irish PEN Award for Literature, Members' News, Members' Publications, Newsletters on 28 November, 2012 by Christine Murray. We will have a note up next week with details on tickets/dates and of course our very special guest for 2013 !